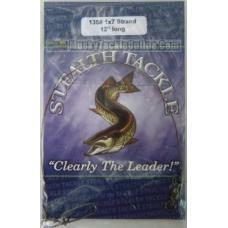 These leaders are mainly used on "walk the dog" style glide baits or jerkbait where it is not nessas.. 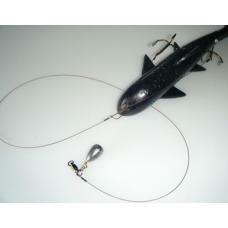 This is a solid wire 240 pound test walk the dog jerkbait leader with a #5 Stay-Lok snap. There is n.. These are our most popular wire casting leaders. 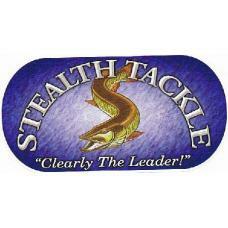 Handmade one at a time and come standard with our 1..
Stealth Tackle has teamed up with successful Minnesota tournament angler Brad Swenson to bring you o.. 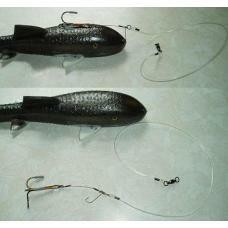 These leaders were designed along with help from Madison Wisconsin Musky guide Jeff Hanson. 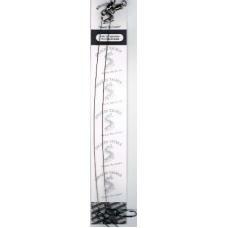 Jeff pro..
Our Spring Leaders were specifically designed for use with smaller style rattle baits that are used ..
2 Pack 124# Solid Stainless Steel Wire Leaders aprox 6" long. 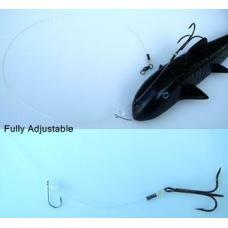 A Leader for use with Lures ..
Comes standard with a 150# Test Stealth Tackle Ball Bearing Swivel and Stringease Stay Lok Snap. The.. 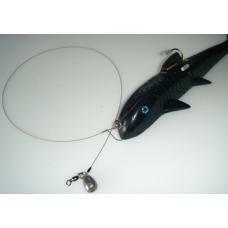 They come standard with a 100# Stealth Tackle Ball Bearing Swivel and #4 Stringease Stay Lok Snaps. .. 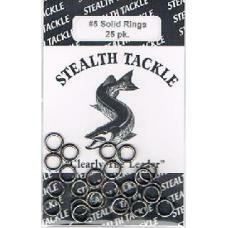 These come standard with our 150# Stealth Tackle Ball Bearing Swivels and #4.5 Stringease Stay Lok S.. 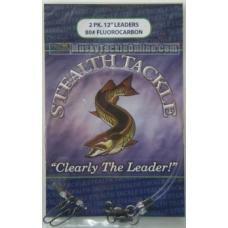 These are our top selling fluorocarbon leader. These leaders have become a favorite of many Muskie F.. 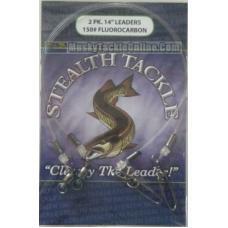 These are the as Stealth's standard 130# casting leaders. Only instead of the standard Stay-Lok Snap.. These leaders come standard with our 150# Stealth Tackle Ball Bearing Swivels and #5 Stringease Stay..
Standard with 150# Stealth Tackle Ball Bearing Swivels and #5 Stringease Stay Lok Snaps. 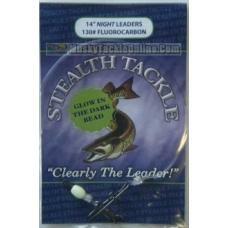 These leade..
At 130 pound test, the same great quality as Stealth's regular leaders only with a glow bead. Great ..
Our #1 selling Trolling Leader. 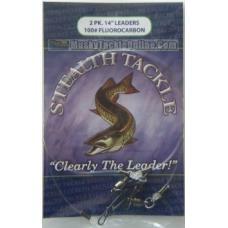 This Leader comes standard with our Stealth Tackle Ball Bearing Swiv..
Black Nylon Coated. 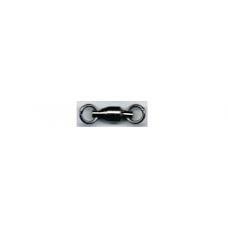 These leaders come standard with a 150# Ball Bearing Swivel and a #5 Stringease .. 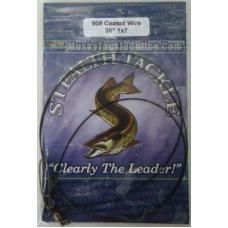 This Stealth Tackle keel weight is great for trolling bucktails to help eliminate line twist. 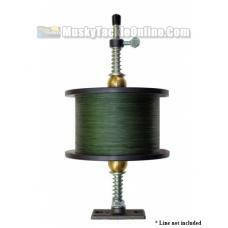 It wil..
130# test 18-20 inch Stealth fluorocarbon leader, with a solid ring attached to 90# afw sevenstrand,.. 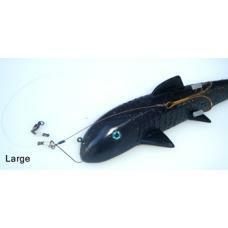 Same as the regular model but made with a longer 90# sevenstrand for extra large suckers, or for fol.. 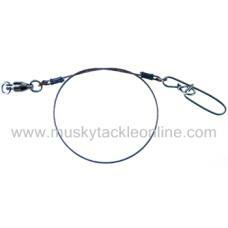 Double Hook Hulcano Harness. 18" 130# test Fluorocarbon lead to 90# 1x7 Stranded wire with 2 3/0 wid..
Our Stealth Tackle All fluorocarbon rigs are designed to give your live bait the most natural appear..
Our Single Treble hook Hanson Harness Quick Strike Rig, uses our standard lip hook rigging method. 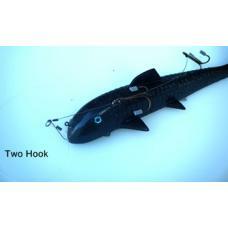 N..
Our Double Hook Treble hook Hanson Harness Quick Strike Rig, uses our standard lip hook rigging meth..
For those of you that build your own leaders and prefer to use a solid welded ring intead of a snap,.. 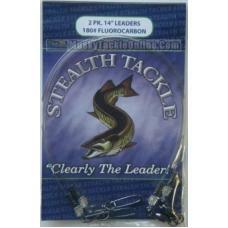 These are the same exact high quality ball bearing swivels used on Stealth Tackle's leaders. #4,..